NOTICE: THIS SUBORDINATION, ATTORNMENT AND NON-DISTURBANCE AGREEMENT RESULTS IN YOUR LEASEHOLD INTEREST BECOMING SUBJECT TO AND OF LOWER PRIORITY THAN THE LIEN OF SOME OTHER OR LATER SECURITY INSTRUMENT. Owner and Tenant have entered into that certain Lease dated _________, together with any amendments, modifications, renewals or extensions thereof ("Lease") pursuant to which Owner leased to Tenant and Tenant leased from Owner the premises more particularly described in the Lease ("Premises") and located on the real property described in Exhibit "A" attached hereto (the "Secured Property"). Owner has obtained financing for the Secured Property and has executed a promissory note in the principal amount of _________________________ Dollars ($XXXXXXXX) ("Note") in favor of Beneficiary, payment of which is secured by a Deed of Trust ("Deed of Trust") encumbering the Secured Property and an Assignment of Real Property Leases and Rents. 1. Subordination. 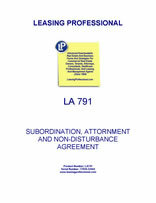 The Lease is and at all times shall continue to be subject and subordinate to the Note and the lien of the Deed of Trust and to all advances made or to be made thereunder, and to any renewals, extensions, modifications or replacements thereof, unless Beneficiary has filed a notice subordinating the lien of its Deed of Trust to the Lease. Beneficiary specifically reserves the right to file such a notice at its sole election. Tenant shall not subordinate the Lease to any lien, claim, mortgage, deed of trust, or other encumbrance of any kind, except as provided in this paragraph, and any such other subordination shall be deemed a default under the Lease and this Agreement. Tenant agrees to execute and deliver to Beneficiary or to any party to whom Tenant hereby agrees to attorn, in form and substance satisfactory to such party, such other instrument as either shall request in order to effectuate the provisions of this Agreement. 2. Limitation on Liability. Nothing herein contained shall impose any obligation upon Beneficiary to perform any of the obligations of Owner under the Lease unless and until Beneficiary shall become an owner or mortgagee in possession of the Premises, and Beneficiary shall have no personal liability to Tenant beyond Beneficiary's interest in the Secured Property. 3. Attornment. In the event of a foreclosure or other acquisition of the Premises (including, without limitation, by deed in lieu of foreclosure), the Lease shall be recognized as a direct lease from the Beneficiary, the purchaser at the foreclosure sale, or any such subsequent owner (collectively referred to as "Purchaser"), except Purchaser shall not be (i) liable for any previous act or omission of Owner under the Lease; (ii) subject to any offset which shall theretofore have accrued to Tenant against Owner; (iii) subject to any obligation with respect to any security deposit under the Lease unless such security deposit has been physically delivered to Purchaser; or (iv) bound by any previous modification or prepayment of rents or other sums due under the Lease greater than one month unless such modification or prepayment shall have been expressly approved in writing by Beneficiary, which approval shall not be unreasonably withheld. 4. Non-disturbance. So long as no default exists (after notice, if any, required by the Lease) as would entitle Owner under the Lease to terminate the Lease or would cause, without any further action of Owner, the termination of the Lease or would entitle Owner to dispossess Tenant thereunder, the Lease shall not be terminated nor shall Tenant's use, possession, or enjoyment of the Premises be interfered with, nor shall the leasehold estate granted by the Lease be affected in any foreclosure, or in any action or proceeding instituted under or in connection with the Deed of Trust and Lender shall recognize Tenant as the tenant of the Premises and Tenant's Option to Purchase and Right of First Refusal under the Lease for the remainder of the term of the Lease in accordance with the provisions thereof.